Kemaea Mase (17), on a wheelchair in her house, Pari village. 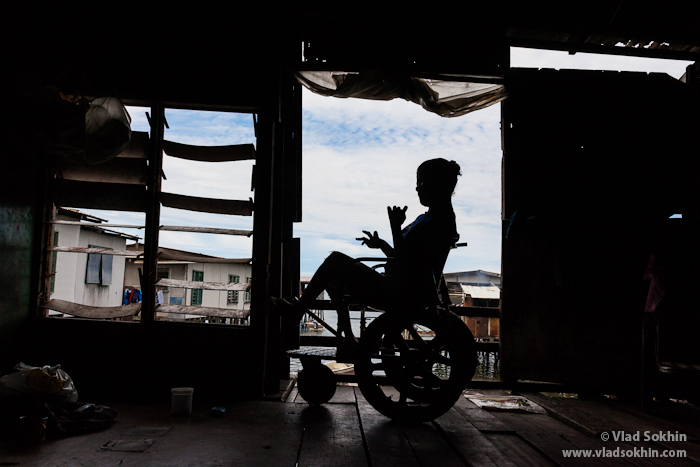 Kemaea Mase (17), sitis on a wheelchair in her house, Pari village. She was born healthy, but at the age of four she became paralysed. By the age of 16, she was always laying on the floor of her house, until she has got a wheelchair, donated to her family. Hovewer, Kemaea still can’t go to the street, as there is no ramp to her house, which is lifted from the water on high poles.